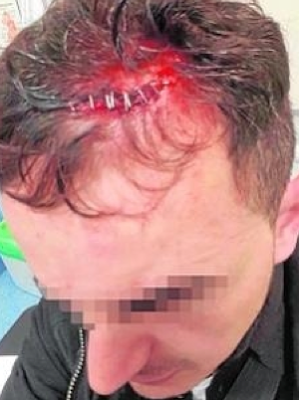 Just this past month alone, 15 Spanish police officers have been badly injured in brawls involving members of Dominicans Don't Play (DDP,) the most violent street gang in Spain, and possibly in Western Europe, and their rivals the Trinitarios. The DDP got its start in New York City in the early 1990s, with their numbers reaching critical significance in the early 2000s as the group expanded its influence throughout the Dominican community in the United States. The finances required for Spanish expansion came via Western Sahara, where the group's financiers threaten to potentially destabilize the government. The gang is well-connected with Colombian drug cartels, and thus provides, along with the Trinitarios, nearly all of the narcotics sold in the Madrid area. Competition is fierce and brutal, and since 2009 the two groups have been killing each other over absolute control of the drug trade, eventually marginalizing the Ñetas and the Latin Kings, two pan-Latin street gangs previously prevalent in Spain. The Ñetas and the Latin Kings have essentially been decimated through a calculated campaign carried out by the DDP and the Trinitarios, who likely had a mutual agreement to squeeze out non-Dominican supremacist groups before attacking each other. Most Dominican children spend their youth in the baseball fields, fiercely competing to see who can throw the fastest, most accurate curveball, and who has the hardest bat swing. Bats and bottles are not weapons to be taken lightly in Dominican hands, and their easy accessibility late at night means that most any police officer, before even reaching for his gun, could be blinded by glass thrown across a distance by an assailant. This type of mass attack using improvised weapons took place just weekends ago, with 6 members of DDP injuring 15 police officers before they were subdued by an additional 15 members of the Spanish police. Brutal as bat and glass attacks may be, directed machete attacks against opponents have basically left competing drug traffickers terrified in the capital. What makes the DDP and the Trinitarios scarier than other gangs is their willingness and history of killing minors in the New York City area, as well as in Spain just this month with the brutal stabbing of a 15-year-old. The two gangs particularly frighten the Spanish police because they skillfully use the internet to market themselves and to organize events at specific places where members of the two rival groups can "kill each other," often having the same effect as publicly issuing a terror threat, and thereby costing the authorities scarce resources in an already austerity-hit environment. The situation is so serious that Spanish newspapers play down an incident as "not too numerous" when only 25 people are involved in brawls. The group doesn't recruit the idle, as members have to pay fees, usually through selling narcotics or by hacking rivals to death with machetes. As Spanish police crack down on the group, members of the Dominican community find themselves marginalized and feared, often radicalizing the most young into joining the very groups they are discouraged from joining. Given the current political and economic instability in Spain, it is near certain that these massive brawls and attacks will continue. The Spanish police likely has undercover officers trying to infiltrate the groups, but given their closed natures, the task is extremely difficult. At one point, it becomes difficult to discern if a member of the gang is acting under police directives, or of his own volition.